A vitamin B12 deficiency can cause symptoms such as tiredness, confusion, pale skin and recurrent mouth ulcers. HealthAid Vitamin B12, also known as Cobalamin, promotes the break down and conversion of carbohydrates, fat and protein into energy. A healthy nervous system and the production of red blood cells are also supported by vitamin B12. 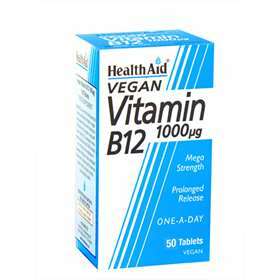 B12 is often found in meats so vitamin B12 food supplements are recommended for vegetarians and vegans. Free from yeast, gluten, wheat, soya, dairy, salt, artificial colours, preservatives and flavourings.